Promotional Opportunity You've all heard the saying 'a picture speaks 1000 words' and that's so true when it comes to our products. Without images to show what we make we'd likely not have any buyers. Shop Handmade UK is now at the point where I'm designing cards, flyers, online adverts & press releases therefore I need images for these to help buyers see the quality of the goods that all you talented designers make. To do this I need your help and permission. If you would like to submit your images to be used in Shop Handmade UK's promotional and marketing material or have any questions then please get in touch via our contact page or leave me a comment here. As these images will be used for print they must be 300dpi high res. If you do not have any in high res then your images may be used for online ads. Please only send a link to your product and I'll be in touch to request high res images. Where will this marketing material be used? Business cards would be used daily, flyers are being designed to be distributed at events such as the Misi event in Bristol and Shop Handmade UK is exhibiting at Handm@de Fair at Oxford in November so these will be going directly to buyers. Images would also be used for online advertising on quality and well known websites of course. As mentioned above Shop Handmade UK will be exhibiting at the Handm@de Fair at Oxford in November and in the lead up to this I'd like to launch a Competition to win a selection of gorgeous handmade goodies. This will be promoted mostly outside the crafting community with an aim to draw buyers to the directory and in turn to your selling sites. I'm aiming to promote the competition at Handm@de Oxford with the closing date shortly after. This will be promoted on the Competitions page on the website, anyone who donates a prize will have their item shown with a link to their store &/or blog. If you would like to donate a prize then please get in touch via our contact page or leave me a comment here. Hi Belinda, this all sounds very good. I'd like to participate in the giveaway you mentioned. There's the item http://www.etsy.com/view_listing.php?listing_id=30720307. Let me know if it's okay and what to do next. Thank you, Julia. Thanks so much, they are gorgeous and perfect timing as the comp will likely end around early December. I'm hoping to open the comp mid Oct so I'll be in touch in the next 2 weeks. I'd love to donate something to the giveaway if you're still looking for items? This necklace http://glitterysah.com/shop/index.php?main_page=product_info&cPath=4&products_id=40 - plus a Born Again Ring of the winners choice, theres loads in my shop to choose from. Hi Belinda, sounds a great idea and I'd be happy to submit images for use. When is the deadline as I've a winter collection underway. Glitterysah, lovely bright necklace and I love the Rosie Rose Ring & the Emerald City Ring. I'll be in touch with you in about 2 weeks with more details. Estee my only real deadline is current events I'm planning to use flyers for so I'm looking at about 7th Oct but this will be ongoing to refresh marketing material. Helen, I've contacted you via your webpage. Thanks! Jenny thank you for the donation of one of your brooches, they are lovely. I'll contact you direct via Folksy about images. Thanks for your donation, lovely bright colour. I've contacted you direct via Folksy. I too would be interested in both. I can donate any of the dogs shown or can make one specially. Thanks for your donation. They are all too cute. I'll be in touch in the next 2 weeks with more details on where to send it. I'll have some xmas themed ones ready by the end of the week so let me know if you think these would be more appropriate? I love the cupcake brooch. I think that would be lovely and appeals to a wide age range. I'll be in touch in the next 2 weeks with more details. I'd be happy for you to use any of my images. I have been away so my shop is a little empty but I'll be restocking this week so there should be more to choose from! oops, a link to my shop would be helpful! I'll contact you direct via Folksy. If you'd like to use images of any of my work that would be perfectly alright. Good to hear things are growing and good luck at Handm@de Oxford. Thanks for your image offer. I'll contact you both direct via Etsy / Folksy. Happy to send you some pictures or for you to take them off any of my sites if they are good enough for you :) I'll be at Handm@de Oxford too so I'll see you there! Thanks for the image offer. I've had a look at your site and most of the images are low res which is fine for me to use for online ads but if you did have some high res please email them to me. If not it's not a problem. I'm enjoying hearing that ShopHandmade is growing, expanding and... who knows... taking over the craft world, in the UK at least?! I would delighted for you to use any of my images! Either for print or online! Would love you to use any of my images, will you let me know what you'd like or how to go about it all? Not sure about the "resolutions" bit, maybe you can advise me! 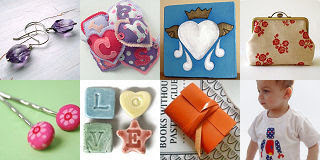 If you'd like a small Heart chalkboard to add to the growing collection of prizes then I will happily send that too. I'll contact you both direct via Etsy / Your Website. Thanks for the offer, I'll browse your Etsy store and website now. Love your Orange Mini Journal. I'd love you to use one of my images, if you think they are suitable of course! I have the bracelet all ready for you, just let me know where you want it sent when you are ready. Feel free to use any images from my Folksy shop http://www.folksy.com/shops/melshandmadecards I also have more of my past works on Picasa if you want any, they are probably higher resolution. Let me know and I'll send you the link. Also let me know if there's anything you would like by way of a donation. I'm due to upload some Halloween items over the weekend. Please have a look at my folksy shop and if there are any images you'd like to use let me know and I'll send you a high res version. I'd be happy to donate one of my pack of four notecards. I'd be happy to donate a screen printed furoshiki. Please have a look at our folksy and coriandr shops for examples. Please also let me know if there are any images you'd like to use and I'll send them to you. I would love you to use any image from my etsy shop. Also I could make a pair of Dorset Button Hair Snaps as a donation. Like these http://www.etsy.com/view_listing.php?listing_id=31017905 or these http://www.etsy.com/view_listing.php?listing_id=30635379. Whichever you would prefer. I've still to go through images but I will update you all when the designs are finalised. Veryan, Mel, Nicky, Mich & Alix, Thanks for your donations, I've sent my address to you all via email / Folksy / Etsy. Thanks to everyone who has donated so far. We've had donations from 20 designers with a lovely prize pool worth over £225. I'd still love to add some homewares and art to this great prize so please get in touch if you can donate. I'd love you to feature one of my pieces. My website is www.annaclifton.com if you'd like to have a look. I have high res images of everything though. Also I'm more than happy for you to use any of my images. My Etsy shop is here - http://www.RoseAndRaven.etsy.com - not sure if they are high res or not? I'd like to submit some images if you are interested. I could also donate a loopy brooch. Those are all images are mondo. They are knows that is unique and most beautiful. I am interesting in first one. I think it's bracelets. Everone are familiar that product. Now a days it's most popular in teen age as well as young age.